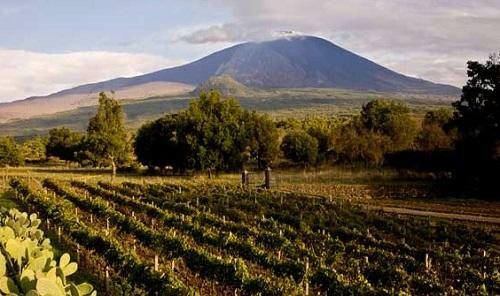 The Etna towers from above outlining the profiles of the landscape, offering its land so its fruits can be harvested, reminding all of its irresistible power. 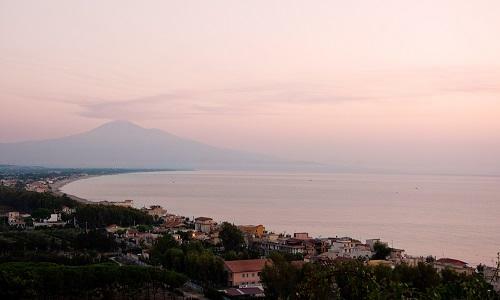 This is the unbreakable link between the Etna and Catania, the gem of eastern Sicily. 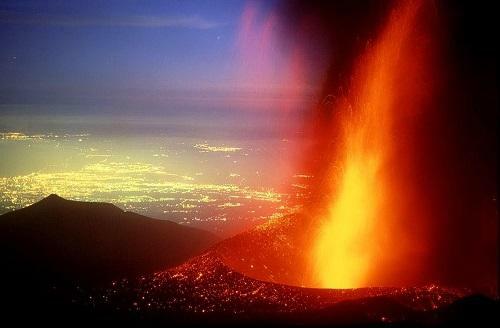 The Etna, one of the biggest active volcanoes in Europe lies north of Catania. This mountain lives, breathes and continuously transforms itself by the flowing lava, deposited in the open spaces or overlapped with ancient flows, changing the mountain’s profile each time. 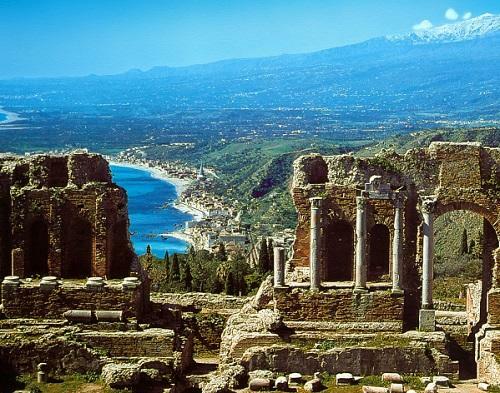 The coastal strip, the beauty of which has nothing to envy about other “lords” of the coast, looks out over the Ionian Sea which is the other natural boundary of the province. 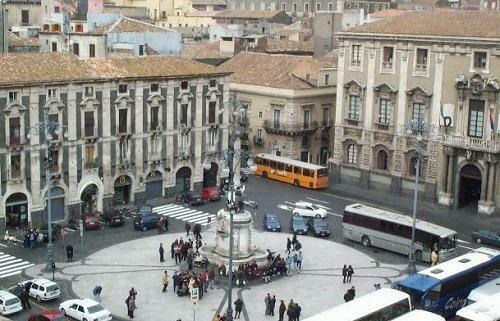 Lying in a green cradle, Catania opens out like a beauty, to gather with its grand squares and wide roads its lavic rock architecture, and recall its past destruction and reconstruction, with those burnished hues that seem to struggle with the intense rays of the sun shining over this land. The city is full of attractions, offering a historical and artistic legacy for everyone to admire. With its lively city buzz, its gaiety and cheerfulness, it expresses the reality of an open and carefree populace who are well aware that life has to be lived every moment, day after day, without leaving for tomorrow the smile that can be given today. The big and small centres of this region are marked by different cultures that have crossed the land. Traces of history show a culture that has absorbed the influence of many rulers, as seen in the architectonic lines of its buildings, churches and monuments, perfectly blending with the beauty of nature, demonstrating its generosity and benevolence, but also asperity and severity. 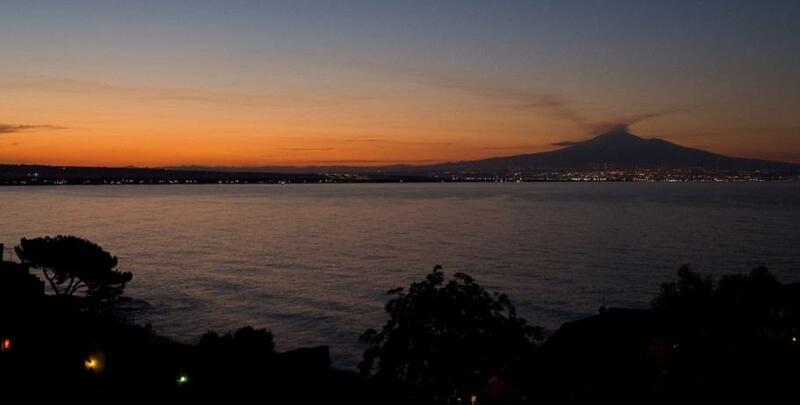 The Etna symbolizes all this. High, impressive, with its peak wrecked by a great mouth of fire, it looms over the entire landscape, a great part of which has been designed by its own power. When you reach the top, you will be enchanted by the extraordinary view extending to the horizon as far as the eye can see. The 17th century was a destructive one, whereas the 18th was a rebirth. 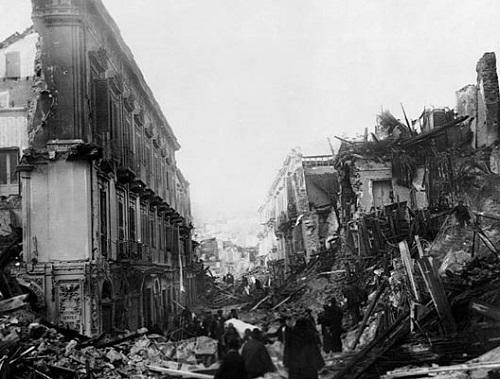 The onset of an eruption, then an earthquake brought Catania to its knees. 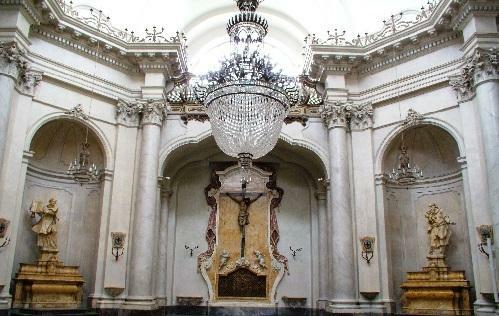 It resurrected from this devastation and triumphed with the beauty of its Baroque architecture which can still be admired today. The Cathedral is a magnificent example. Looking out onto the square carrying its name, which after the earthquake was designed to leave ample space between buildings in the event of destructive earthquakes. It is dedicated to the city’s Patron, Santa Agata, whose statue surmounts the main façade designed by Giovanni Battista Vaccarini. 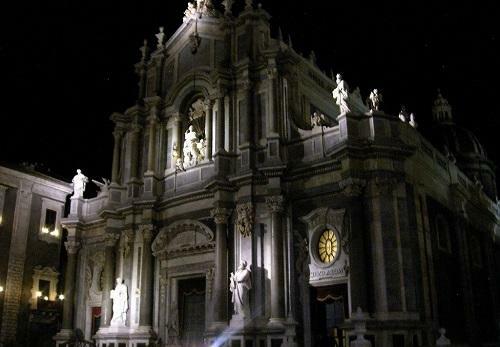 Besides the church, the splendid Piazza Duomo is surrounded by the Palazzo Senatorio and elegant noble buildings arranged around the Fontana dell’Elefante, the symbol of the city. The monument, the work of Vaccarini, is a kind of historical stratification: the base (the elephant) recalls Carthaginian civilization, the obelisk recalls Egyptian civilization, and the cross, palms and globe refer to Christianity. 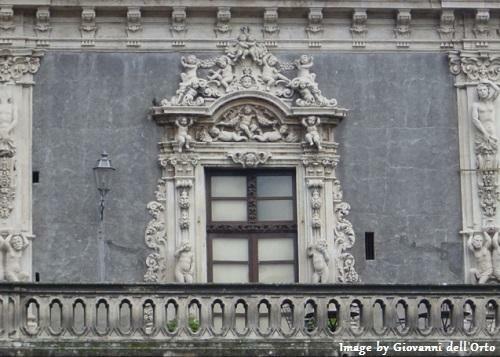 The artist also designed the Badìa di Sant'Agata church, very striking for the richness of its décor on the façade, with the perspective of the portal set further back with respect to the two lateral bodies. 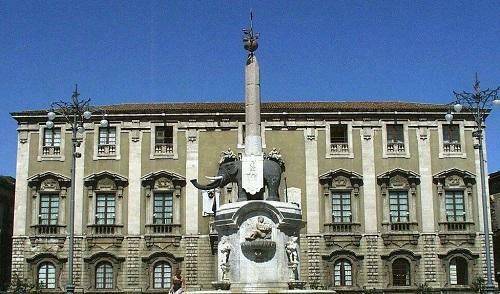 Piazza dell’Università is dominated by the grand façade of the University, the construction of which was authorized by Alfonso V of Aragon and rebuilt after the earthquake with a design by great architects of that era. 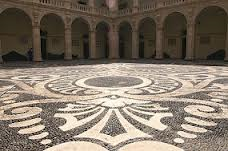 Vaccarini built two floors of the internal courtyard, the colonnade and the dual-coloured flooring. 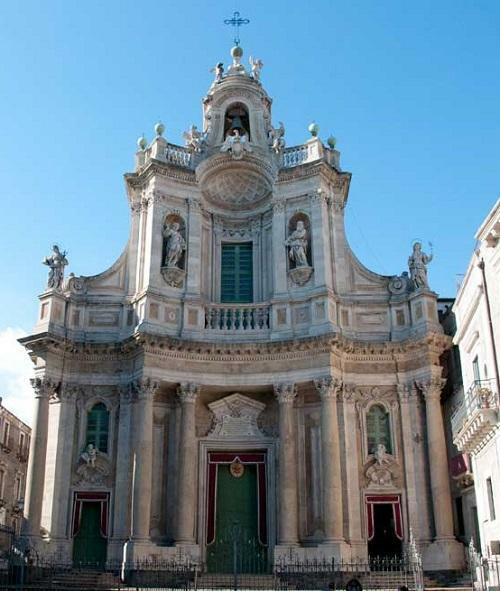 The Collegiata or Regia Chapel is another magnificent example of the architectonic splendor built during the rebuilding century. 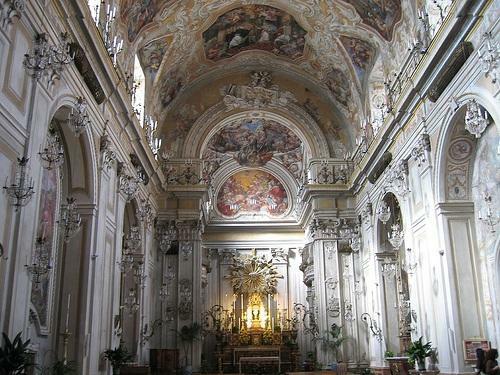 ...with the interior decorated by Giuseppe Sciuti. Colossal even if unfinished, is the Benedictine Monastery of S. Nicolò l’Arena with interventions by Battaglia, Vaccarini and Amato. 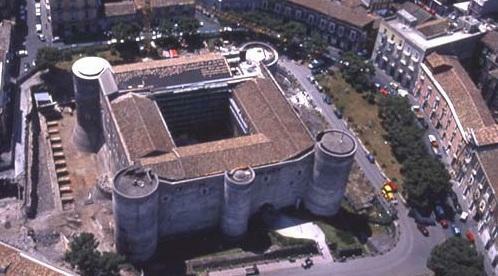 The Ursino Castle which Frederic II ordered to be built, survived the catastrophic events of the 17th century. It was originally located on the coastal stretch but the eruption modified its structure and today, the castle is set further back compared to its initial position. 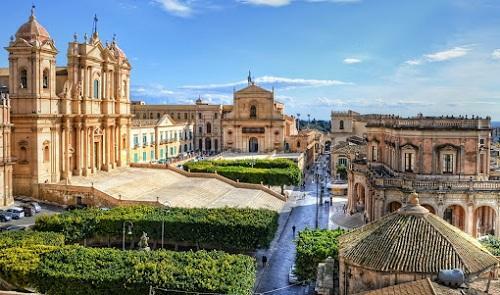 The entire Noto Valley was reconstructed in the 18th century and today is a World Heritage Site precisely because of its stylistic features, impressed after the terrible earthquake which became the theme of its rebirth. The highest expression of its baroque soul is Santa Maria del Monte with an impressive stairway decorated with polychromatic majolica. 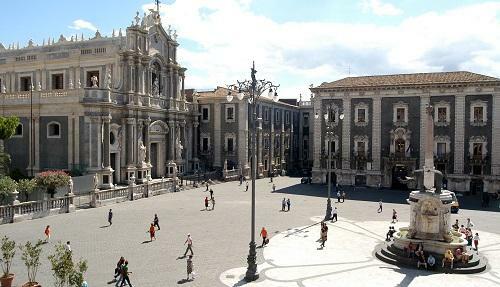 Militello in Val di Catania is also part of the UNESCO network. 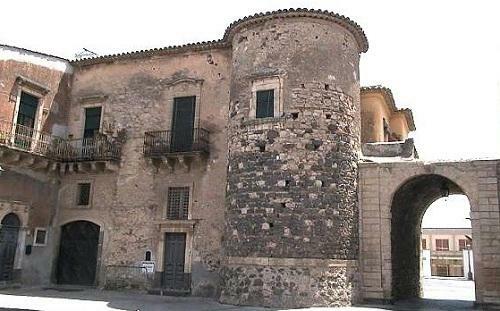 Its historical centre recalls in its structure and style, the features of the reconstruction period. Nothing survives up on the peaks, only the lavic desert, a widespread blackness with the awesome crater in its centre. 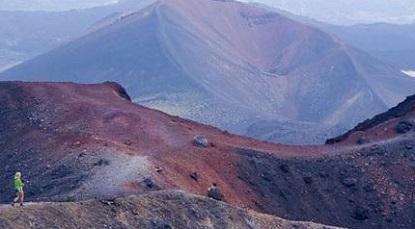 The landscape changes greatly as you go higher towards the principal crater. There are fruit orchards, orange and lemon groves, oaks and majestic chestnut trees, luxuriant vineyards and expanses of beach trees. 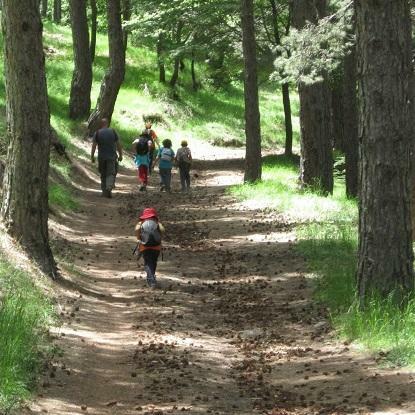 All contribute to making the mountain a varied range of natural ambiences of incomparable beauty. 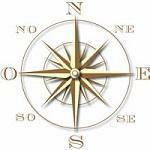 To be able to enjoy its beauty, you need to trace the entire route. 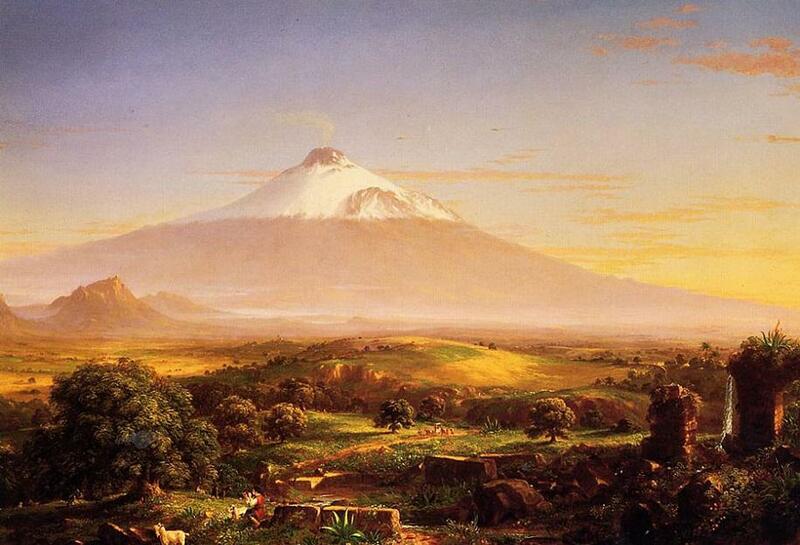 The panorama changes before your eyes, but the enchantment remains. The parks and natural reserves offer an infinity of ideas on how to enjoy your time and learn about quite an unusual nature. 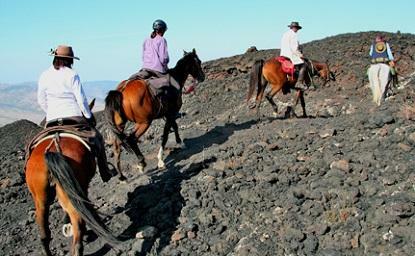 Trekking and horseback riding itineraries are ideal to trail the paths that spread out over the slopes of Etna, through the thick vegetation where many species of animals live. It is also a perfect place to engage in bird watching. Sparrows, buzzards, pilgrim peregrines and golden eagles fly high in the sky above the volcano, while ducks and other aquatic birds live on the waters of Lake Gurrida, the park’s only water basin. The Simeto delta is another excellent bird watching spot. Here coots, storks, sea crows, falcons and herons build their nests to pass the winter. 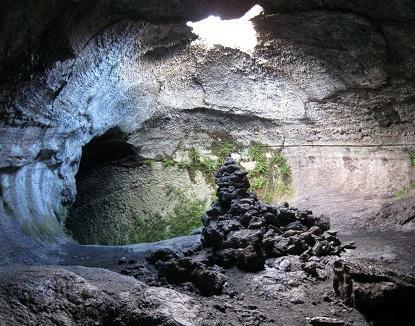 A very attractive sight-seeing itinerary is offered by the 200 grottos in the Etna Park, once built by man as a refuge and burial place. 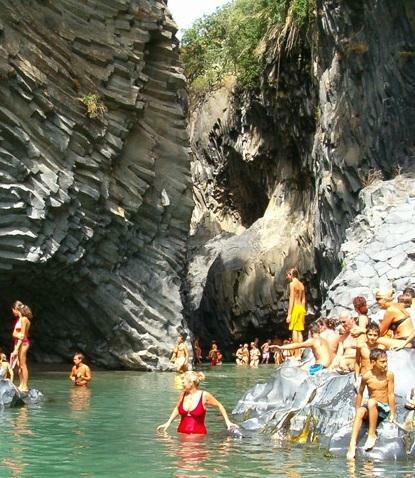 The most renowned are the grottos of Lamponi, Tre Livelli, Gelo and Palombe. 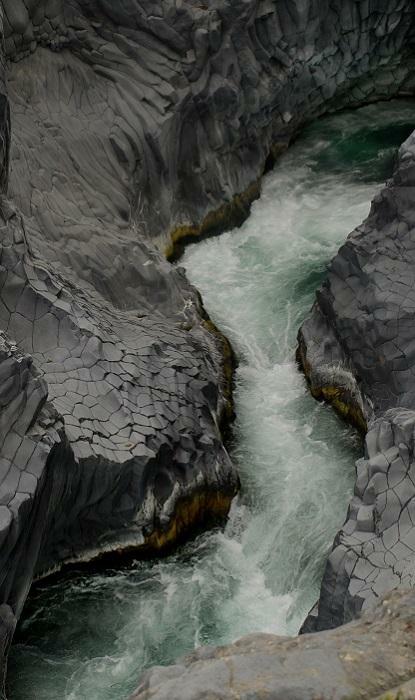 At the Gole di Alcantara the river seeps through the cracks of the lavic mass. Narrow trails run along high rock walls with the most incredible shapes, along which the clearest rivers run to form one of the most exciting and enjoyable sights nature can offer. 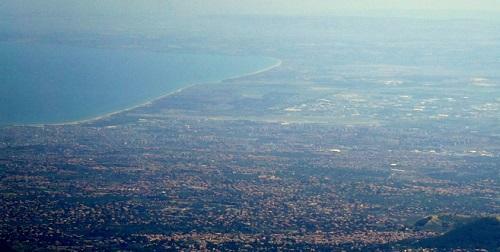 Do not miss the Riviera dei Ciclopi with its typical stacks emerging from the sea. A land kissed by sunlight and lapped by crystal-clear waters, is the dream of those who prefer holidays at the seaside. The innumerable localities of the province are all well equipped to offer a comfortable and relaxing stay. To crown it all, nightlife abounds. Day activities range from scuba diving in the ocean beds between the land and the stacks. 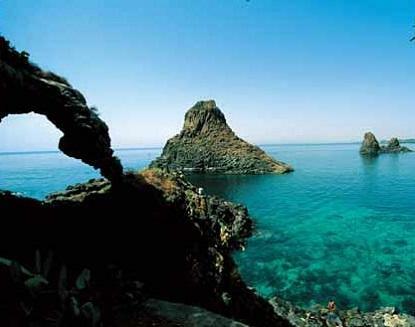 Seawatching and snorkeling is ideal for those who are not familiar with oxygen bottles and diving suits. All wind sports are possible, from surfing, windsurfing or sailing. 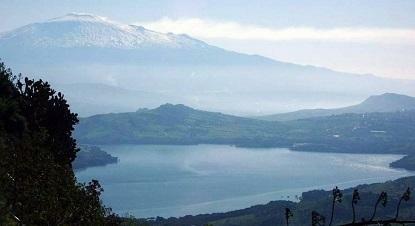 This land’s mild climate guarantees pleasant holidays all year round. 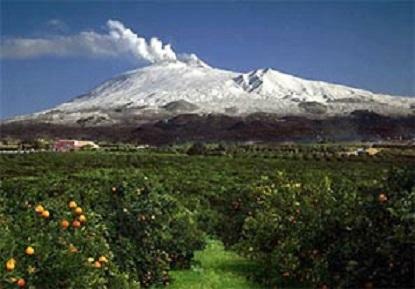 If you wish to put on your skis, come in the winter when the Etna is covered with snow. You will not believe what you see. The skiing facilities ensure a sportive, enjoyable “white” holiday. Skiing with your gaze on the blueness of the sea below is an experience which only this place can offer! 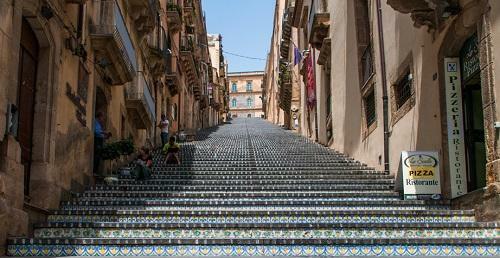 One of the eight cities of the valley, Caltagirone is famous for its ancient ceramic art which supplied the décor of many churches and buildings in the centre. 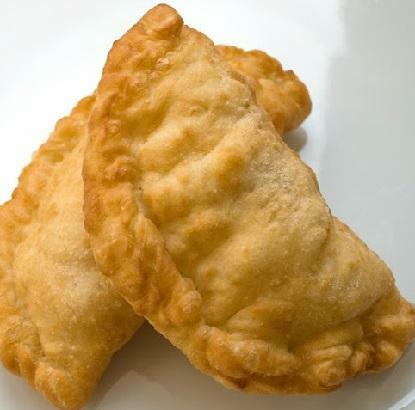 The cuisine of Catania is one of the tastiest in Sicily. Fish dishes are the most traditional. 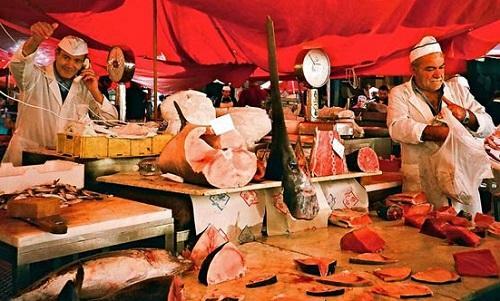 A sea salad may be one with octopus and ox eyes, marinated “Masculini” (sea anchovy), salt-preserved anchovies in typical terracotta jars (cugnetto), peppered raw ox eyes (sea mollusks) and shells seasoned only with a sprinkling of lemon. Mullets, needlefish, scallops and anchovies are the best ingredients for fries, whereas the breams, sargoes and dentex are served baked. 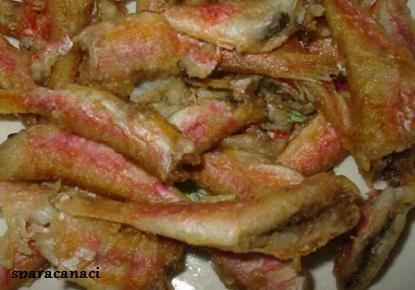 Tasty and very typical dishes are the “sparacanaci,” fish fries of newborn mullets, accompanied by onions from Calabria, and the “u muccu” fries of newborn acciughe little fish. Agriculture is well developed in the hinterland, where you can taste excellent beef, equine meat and pork grilled with vegetables and genuine cheeses. 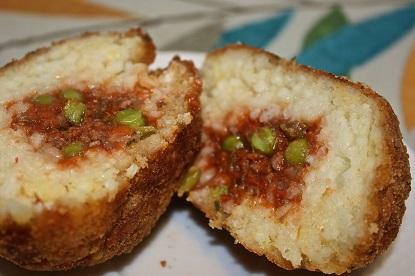 The most typical feature of the Catania cuisine regards the roasts, and the well-known “oranges” (arancini) made of crunchy rice balls stuffed in the middle. 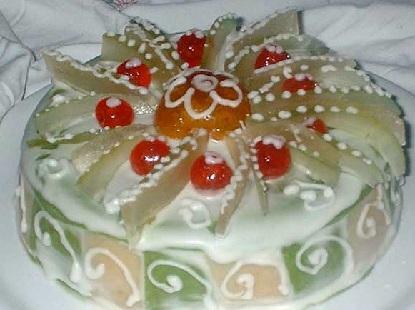 As the saying goes: “the eye needs its share” and preparing cakes for Sicilians is a true and proper art. A triumph of shapes and gaudy colours fill the dessert tray: “cannoli” stuffed with ricotta and decorated with drops of dark chocolate or pieces of fruit candy or finely chopped pistachio, the Sicilian “cassata,” “martorana” fruit based on almond paste, “monaca” biscuits, nougat “torroncini” and Santa Agata raisins. 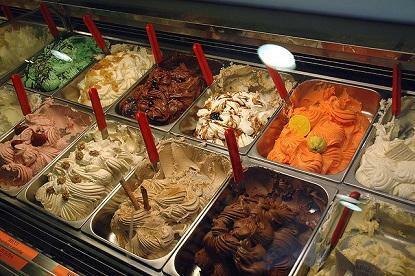 Ice-creams and ice shakes are the other strong points of Catania and the entire region. Different flavours, almonds, lemon, orange, chocolate, mulberry, peach, and coffee, are all spectacular if accompanied with two servings of cream.